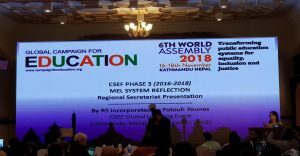 The sixth Global Campaign for Education (GCE) World Assembly commenced 16th to 18th November 2018 under the theme “Transforming public education systems for equality, inclusion and justice” in Kathmandu, Nepal. As stakeholders vested in the right to education, the World Assembly represented a key moment for all of us. It provided a space to reflect on progress made, exchange learnings and ways of working as together we scale up our efforts and global impact in achieving good quality inclusive education for all. ICAE was presented through a strong team. 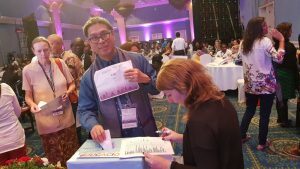 Robbie Guevara casts vote for GCE President during the World Assembly. As a run up to the World Assembly, the CSEF Global Learning event took place from tomorrow, 13th to 15th November, and for the first time GCE hosted a GCE Youth Caucus on the 14th and 15th. As proxy voter for ICAE, Bernie Lovegrove, voted for the amendment to establish a youth-led constituency within the GCE, which was carried. 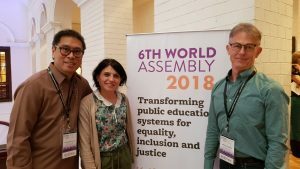 The World Assembly was a opportunity for education campaigners and advocates to come together, debate, reflect and collectively plan according to a challenging and transformative vision, committed to the full realisation of the human right to education for all. This once every four years global event marks a significant moment, as the situation of the education movement worldwide is still in crisis. As we look to the future, tangible actions are required from a strengthened civil society movement to ensure everyone’s right to a free, quality public education. Refaat Sabbah from Palestine has been elected as the new president. ICAE deeply congratulates Refaat Sabbah – along time adult education advocate in Palestine, the Arab World and globally. ICAE is very much looking forward to work with him for the right of education across the world. GCE President Refat Sabbah is congratulated by outgoing president Camilla Croso after a convincing win. 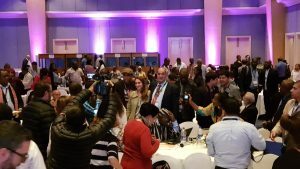 Also Robbie Guevara, ICAE Executive Board member, has been elected by the Asia Pacific constituency to join the GCE Board for the next four years. So ICAE believes that this is a very positive result that will strengthen the voice of adult learning. Robbie Guevara thanks GCE in the name of ICAE putting adult education and youth in the centre of their work and urges them for more consistency in the messages. Below you can read a report by David Archer, Action Aid´s Head of Participation and Public Services and International team. 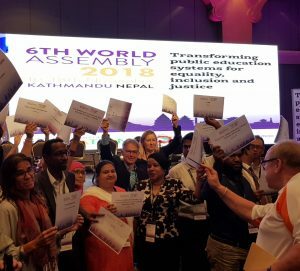 Hundreds of activists from the education movement around the world are gathering this week in Nepal for the World Assembly of the Global Campaign for Education (GCE). This is an unprecedented movement, mobilising thousands of organisations and over ten million people in over a hundred countries, connecting local, national, regional and global action for the right to education. GCE has played a key role in helping to develop ambitious plans for advancing progress on education – from the Dakar Framework for Action 2000 to the 2015 Sustainable Development Goal 4 – and has worked hard to hold national governments and international actors to account for delivering on their promises. But there will be some significant challenges in the coming years and the movement will need to be stronger than ever to overcome them. GCE was formed almost 20 years ago by the coming together of four separate campaigns. Education International (representing teacher unions worldwide) had a campaign for quality public education. Kailash Satyarthi (who later won the Nobel Prize) organised the Global March which campaigned for education as the solution to child labour. Meanwhile Oxfam’s Education Now! Campaign focused on the financing of education and ActionAid’s Elimu Campaign sought to democratise education decision-making by supporting the emergence of national civil society coalitions. In October 1999 all four agencies agreed to work together under a common agenda and the Global Campaign for Education was born. Today GCE has a remarkable depth and breadth. It is rooted in national coalitions around the world which bring together diverse NGOs, teacher unions, parents’ organisations, child rights activists, disabled peoples’ organisations, faith-based groups, student and youth organisations, women’s groups and diverse social movements for whom education is part of their struggle. The precise shape of a national coalition depends on the context, but the intention is to create a broad platform that has to be recognised as the credible and legitimate collective voice of national civil society on education. There are also regional education coalitions that have emerged – ASPBAE in Asia, ANCEFA in Africa, CLADE in Latin America and ACEA in Arab countries – who bring together national coalitions for regional policy and advocacy work. National education coalitions are spaces for experience sharing and collective policy analysis, capacity development and joint campaigning. Most have a recognised role in national education policy processes and many engage actively with parliamentary committees, budget processes and the national media, to raise the profile of education and to put forward credible solutions. They bring evidence and voices from the grassroots to inform and enrich the national dialogue on education, they lobby and advocate and sometimes they demonstrate in creative ways to ensure the voice of excluded groups is heard. Many of these coalitions played a pivotal role in successful campaigns for the elimination of user fees in basic education – which accounts for many of the tens of millions more children who are in school today compared to 20 years ago. In the early days the GCE movement was able to build, and work with, a broad consensus on the crucial importance of public education for national development. There were few tensions or sensitive issues. But as times have changed and the movement has matured there are new challenges. Powerful actors advocating for the privatisation of education and for PPPs seem to be blind to the impact of such policies. In some countries, education systems are becoming so stratified that you can more or less predict the outcomes based on who pays what. In a time of ever-increasing inequality and disturbing tolerance of that inequality, the idea of education as one of the most powerful equalising forces in any society needs to be boldly reasserted. Every child should be given a fair and equal chance to succeed through a fair and equal education system. Twenty years ago, national education coalitions wanting to raise their voice to make the case for education usually had the space to do so. Today too many coalitions face a serious shrinking of political space for their operations. Regressive legislation and aggressive actions in some countries are limiting the space to organise, to assemble and to protest. Indeed, some activists, notably students, are being criminalised for exercising what should be basic democratic rights – and teachers are increasingly a target for attacks. Increasingly we see a connection between the need to defend public space and the need to defend public services. The GCE movement’s inclusive vision of ‘education for all’ and of an education focussed on the full development of the human personality (as expressed in human rights treaties) is also under threat. In the quest for simple goals and targets there are those who want to narrow the focus to achieving outcomes in literacy and numeracy that can be measured in standardised tests. No-one disagrees with the importance of foundational skills, but the unintended consequence of a cult of narrow assessment is to undermine other dimensions of the right to education. We need inclusive education systems that value social and emotional and non-cognitive outcomes – that treat children as active subjects in developing their own potential, not passive recipients of a banking model of education. As Brazilian educator Paulo Freire observed, education can contribute either to domestication (and replication of existing injustices) or to liberation. It is a political choice in every country and every classroom. Globally, GCE has played a key role in advancing the ‘aid effectiveness’ agenda in education, supporting the emergence of the Fast Track Initiative which evolved into the Global Partnership for Education (GPE). GPE This is premised on developing country governments developing credible education sector plans, in consultation with their own citizens, with donors then harmonising their efforts and pooling their funds – to avoid duplication and fragmentation. 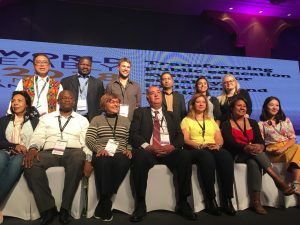 National Education Coalitions have played a key role in supporting inclusive national processes and although there is always room for improvement, elected civil society representative sit on the GPE’s global Board and committees. Sadly, this commitment to harmonisation is now under threat from a proliferation of global initiatives that could undermine the impressive work done to build GPE. We need to work together as a movement to ensure all global mechanisms are focused on strengthening public education system and do not create duplicating structures. Despite some of these challenges, as GCE gets close to its 20th birthday there is a lot of cause for optimism. Over the years GCE has successfully shifted its focus from ‘aid’ to focus more significantly on domestic resource mobilisation which is so crucial to sustainable financing of education. GCE has taken up ActionAid’s 4S framework, looking at the SHARE of the budget for education (towards 20%), the SIZE of overall government revenues (the tax base and macro-economic policies), the SENSITIVITY of allocations (which should be driven by equity concerns) and the SCRUTINY of spending in practice (to ensure funds arrive in the most disadvantaged schools). GCE’s practical toolkit ‘Financing Matters’ articulates this in more detail and has helped to build capacity across the movement to deal in depth with issues that at one point would have been considered far too complex. Similar practical resources on education planning (Planning Matters) and on privatisation of education Public Good Over Private Profit Toolkit show that the movement is continuing to build capacity on the most sensitive issues. To remain relevant GCE will need to continue to evolve. It will need to continue to expand as a movement reaching out more actively to youth and student movements, deepening the partnership with teachers’ unions, strengthening links with human rights activists, connecting with wider anti-privatisation campaigns, working to develop more resources on gender equitable and inclusive education and extending its concerns beyond basic education to confront the challenges of further and higher education. There are policy motions being discussed in Nepal that will contribute to this continuing evolution. But GCE also needs to make connections beyond the education movement, building common platforms with activists working on other public services (whether health, water, transport, agriculture, early child care, even police and the judiciary). There are common issues confronted by all public services and we will need to work together across sectors, finding common cause for example in the case for tax justice and macro-economic reforms that will benefit the public sector as a whole. Today GCE is emerging from its teenage years with a very sound education behind it and with every sign that it will continue to grow into a formidable adult movement. This entry was posted in News by Ricarda. Bookmark the permalink.